I want to wish everyone of my readers a Happy Christmas! This final week to the build up of the big day and been fun, creative and relaxing. I have managed to complete a few festive makes, spend time with my niece and visit some relatives. I even made it to the cinema to watch the latest Star Wars film Rouge One, which by the way was very good with some great surprises for those of us that love the original films. I managed to finish my crocheted Christmas lights, a little fiddly when you first start crocheting each bulb, but once you have completed a few you soon settle into the pattern. Having never really crocheted using black yarn I had not appreciation just how tricky it is - even in good light. These are now hanging up over the door frame, with the bonus of not needing to worry about forgetting to turn them off! 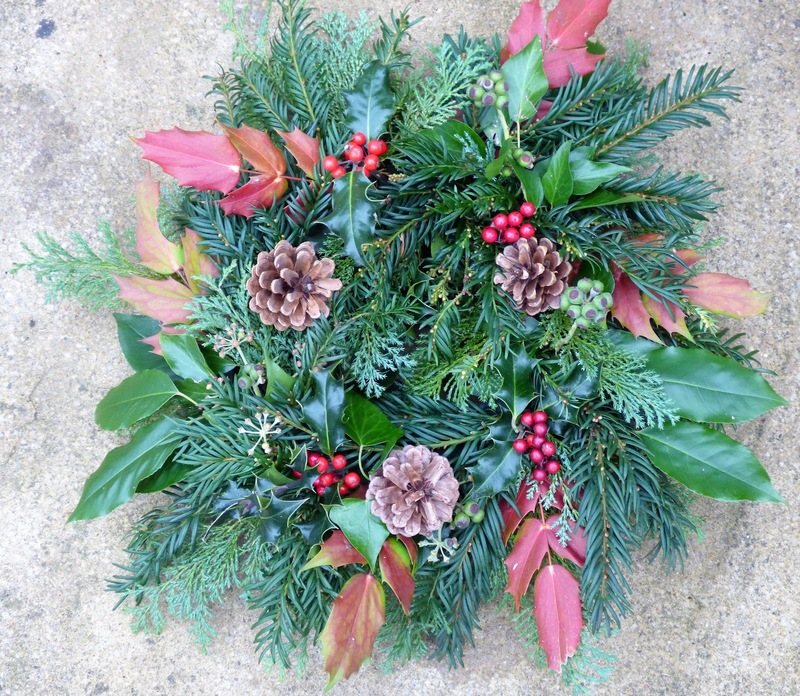 Putting everything I have learned about Flower arranging from the Flower Start course I completed this year, I made a Christmas wreath using greenery from my garden. This will be taken to the grave of my grandparents later this week. Remember to hang up your Christmas stocking! What a lucky blogger I am to receive a wonderful Christmas hamper from Yogi Teas including their Christmas Tea. This wonderful Christmas stocking also included many more herbal and spice teas from Yogi Tea. Making the most of the mild weather a car full of family visited the National Trust property Erdigg, just over the border into Wales. They had a special Alice in Wonderland trail which took us around the gardens and lower part of the house. I have visited a few times, and will be back again, the servants areas of this property are particularly interesting. I have been getting my bake on this week with these buttery festive Chocolate Chip Shortbread biscuits. I love them baked so they have a nice crunch. They are very easy to make with just 4 ingredients, you can find my recipe on my Facebook page. I am linking up with Five on Friday hosted by Amy at Love Made My Home, see badge in my sidebar for more information. Loved your post with the great photos. Had to pin the crocheted lights pic for my sister, as she is the crocheter in our family. Now I'm really eager to get to the Star Wars movie -- your words intrigue. Your crochet light are really beautiful. I love your wreath! You did a gorgeous job with it. Yum on the shortbread - got to say everything is better with chocolate. A lovely festive five and those crocheted Christmas lights are brilliant! Merry Christmas and have a wonderful festive season. Always so much fun to see how everyone celebrates the holidays - how they decorate, what they eat, where they go. Thank you for sharing. Here's to another great year of blogging and sharing in 2017.